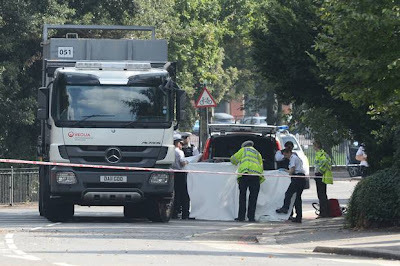 Earlier today a woman cyclist was killed in West Dulwich. By a lorry. Last night, a guy was airlifted to hospital at a junction near Tower Bridge after a collision with.... a lorry. This morning, the Mayor and government transport minister Stephen Hammond MP jointly announced plans to fine HGVs that lacked appropriate safety gear. The Mayor's point? 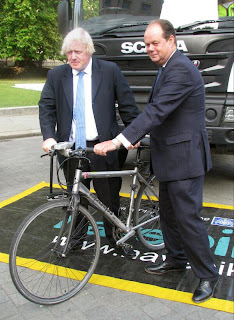 "I have long been worried that a large number of cyclist deaths involve a relatively small number of lorries which are not fitted with safety equipment.” The moves are supported by the government which notes: "a small number of vehicle types – particularly those operating in the construction sector - are exempt from fitting certain safety equipment. The rising number of such vehicles in London’s building boom present a risk to the growing number of cyclists, who now make up almost a quarter of all rush hour traffic in the centre." Those vehicles operating in the construction sector are responsible for a disproportionate number of people being killed or seriously injured in London. Not just cyclists, pedestrians too. As the Evening Standard points out today: "HGVs have been involved in 53 per cent of London cyclist deaths in the last four years, while accounting for only 4 per cent of traffic. Of the 14 fatalities last year, five involved HGVs that would not meet the new standard." "FTA now calls on government and cycling groups to work together in order to ensure that current and future cyclists obey the rules and share the road co-operatively and responsibly." She continues: "if London is to be declared a safe cycling zone, then tougher standards for cyclists’ behaviour should be introduced"
The last time that I had a horrible near-miss experience on my bike was on Super Highway 8. Cycling in from Wandsworth, there were parked cars on my left and in the middle of the road, a traffic island. At exactly this point, an articulated lorry decided to overtake me. The lorry would certainly hit the back of my bicycle and send me flying. My only option was to bail off the road. So I did. I bailed into a parked car. A shocked pedestrian came to help me. The Freight Trade Association is right that road users must ride or drive responsibly. Yes, there is a problem with some cyclists not obeying some traffic regulations. However, every single time the police conduct tests on lorries in London, they find a swathe of the industry content to regularly break the law - overloaded, dodgy tachometers, dodgy safety features. When the City of London conducted spot checks on lorries in 2008, 100% (yes, that's right, 100%) of the lorries stopped at random were breaking the law in some way. Spot checks in Wales recently found 80% of all HGVs were breaking the law. Or, let's just remember Mary Bowers, The Times journalist hit by a lorry in 2011. The driver was on the phone (hands-free) at the time and then "and then failed to put the handbrake on when she was trapped under his wheels". The driver had previously admitted a series of tachograph offences, "including driving a lorry for 20 hours in one day when the maximum is 9 hours". Jurors concluded he had been "too engrossed in a telephone conversation with a work colleague, on a hands-free mobile kit, when he knocked Ms Bowers off her bike". He then tried to deny he'd even been on the phone in the first place and subsequently pleaded guilty to (again!) "driving in excess of the permitted hours". The pendulum of responsibility swings both ways, Ms Dee, and if you're going to start throwing stones about the place, you'd better be sure your own glasshouse is made of stronger materials. The Freight Trade Association could, and should, be supporting the moves to create safe space for cycling. Instead, it is victim-blaming in the extreme. Instead of calling for ways to magically make hundreds of thousands of people cycle as if they were in motor vehicles, it could join the current thinking, displayed earlier this week at the London Cycling Campaign ride to Parliament: Create Safe Space for Cycling. That's the only way to keep lorries and people on bikes apart. And it's the only thing that's going to work. Victim-blaming is immature, irresponsible and makes dialogue an impossibility. The Freight Trade Association should know better. Maybe the FTA could take a leaf out of someone else's book: the Mineral Products Association. The MPA is insisting its lorry drivers receive "vulnerable road user training"; it has a policy of encouraging safety equipment. Frankly, well done the Mineral Products Association. We welcome your policies and your responsibilities. Let's take the conflict out of our transport networks. Let's encourage all road users to act responsibly but let's also look at how the transport network works for different types of people who need to use it. Let's not resort to pathetically juvenile and extremely irresponsible victim-blaming of the sort that the Freight Trade Association has just displayed. British Cycling called earlier today for lorries to be banned from central London during rush hour in the same way that HGVs are banned in Paris and in Dublin. If the Freight Trade Association is going to play so casually with people's lives, then I think that British Cycling has a serious point. Let's encourage responsible organisations like the Mineral Products Association but let's insist that the Freight Trade Association is shunned until it learns to behave in a mature and responsible fashion. It's also well worth viewing the BBC's take on this and watching the illegal lorry driver who's been pulled over by the police criticising cyclist behaviour.